THE WALKING DEAD Season Six Promo Art Suggests Lines Being Drawn. AMC has released a teaser promo art pic for the upcoming sixth season of The Walking Dead. 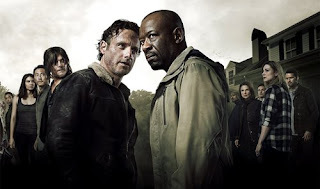 It's great to see Morgan back in the show, but if you read the various sources around the web, they are suggesting that this poster art suggests there will be a divide amongst the group. And that divide shows who supports whom by who they're standing behind..
Maybe and maybe not. I don't like to put too much into a pic of people just standing around. But then again, I can't argue the premise. It makes for fun conversation. While we're chatting up zombies, don't forget Fear The Walking Dead, the spinoff that will take place in Los Angeles, and shows us the start of the "flu," as one promo bit called it. According to sources, sooner or later the time lines between the two shows will probably start to line up. But how do they really feel about it?